I have just read a book that has gone straight into my top ten, but explaining why is difficult. My daughter, sending it to me for my birthday, wrote; I really hope you like this book – it’s lots of fun & a bit bonkers, but a very enjoyable story and a brilliant heroine. 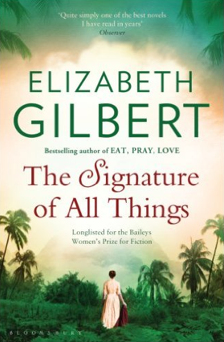 Elizabeth Gilbert’s The Signature of All Things has, above all things, a brilliant heroine. I don’t remember a story so straightforwardly told and yet in which I was continually taken aback by the next turn of the narrative. This sense of being caught in mid-arabesque and sent in another direction persisted to the end of the last printed page – the acknowledgements. This is a long book and I wondered as I started, if I would ever get to the end. There were even moments when I thought, I’m not sure I like this book, yet I kept turning the pages. The narrative style is dry, yet moving; the subject matter is sometimes alarmingly microscopic, yet captivating; the narration is eyebrow-raisingly frank, yet always believable. It is really a story about human curiosity, it might even be a story about growing old, or it might be a story about all the things that interest the reader most. If I had my way, which of course I won’t, everyone would read it. Almost all women would find great enjoyment here. Women who work in the sciences should search it out and consume it. Gilbert also wrote the best-selling autobiographical, Eat Pray Love, which seems to have divided readers into lovers and haters. I can’t tell which I will be, but I have a feeling that The Signature of All Things is a very different story. In this one Gilbert has slotted total fiction into a very real and fact-filled part of western history. Oh, and it’s a garden lover’s paradise too. It more or less starts in Kew Garden and ends in… but I’d hate to be guilty of a spoiler. Happy Winter Solstice, Christmas, New Year or whatever you are celebrating. 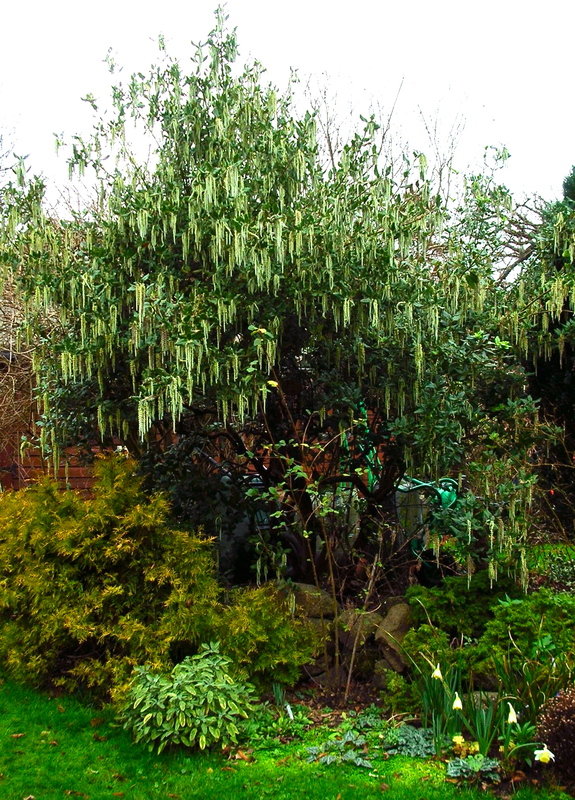 Here is a happy Garrya elliptica and some surprised daffodils. I saw winter aconites out in a nearby garden! This entry was posted in Gardens, Reading, Writing notes and tagged daffodils, Eat Pray Love, Elizabeth Gilbert, Garrya elliptica, Kew Gardens, science, The Signature of All Things, women scientists by hilarycustancegreen. Bookmark the permalink. They are ahead of me. I am ordering what will be left come March. I din’t like “Eat, Pray, Love” that much, mainly because I thought she wasted time in these beautiful countries with …well with Eating, Praying and searching for love. However, I liked that book. Like you I wasn’t sure from the start, but it grew on me. Ah, I did wonder, reading the reviews for Eat Pray Love if I would like it as much. It is a book that grows on one, I think. But it also took me out of myself during a tough time, and was sent to me by a dear friend, a total surprise. I was very thankful for it. And now for your photos of daffodils and other growing things at this time of year. My best wishes for the season and 2016, Hilary. I’m always so pleased to read your blog. Thank you so much. I can imagine that it is a good book to read in a difficult patch. It is absorbing, unpitying and a view from above that makes the world look smaller and more manageable. A good way to put it. Are you staying home for Christmas? We are. I enjoyed EPL because I read it at a time of a huge transition in my own life so it sang like a choir for me. I’ve listened to her speak on writing and I have her book “Big Magic” on my list of books to read, so clearly I’m a fan. I love that you were ambivalent at first but it won you over. I can’t imagine that you won’t enjoy this one too. I shall have to read the others, she is a very un-pigeonhole-able writer. I am sure you will enjoy it. The trick is to read without expecting to know what might happen next. (I’m not sure that makes sense, sorry). Is it a book for old men like John Suchled. I think it might be exactly what the doctor ordered. I’d be very interested to know if this is true. I’m glad. Enjoy your holidays too. I just mentioned this book to Helvi and she told me she has read it and agrees that it is a good read. Helvi devours books before breakfast, like a starving man coming out of a Siberian gulag. Her side of the bed is now more and more in danger of a land/bookslide towering above and next to her. I am reading, ever so slowly, a good book by Ann Tyler ‘A spool of blue thread’. Ah, It’s a long time since I read an Ann Tyler, thanks for the reminder. I’m glad Helvi approved of this book too. It’s a real one-off – rare in the genre-filled book world these days. “Surprised daffodils..”…maybe they’re just as surprised as you are! Indeed. I look back and see many mild Decembers with primroses and even violets, but NEVER have I seen a daffodil before late February (I have photos of those same daffs on March 14 in 2014). Watching for the first yellow aconite globes is what gets me through the dark days of January, so yes, we are collectively surprised. No, Helvi looked up her booty of books and it was Elizabeth Gilbert’s ‘eat pray love’. She read it and thought it alright but a bit complicated and meandering hither dither. I got she felt lukewarm about that book. Sorry about the confusion. Remembering so many books isn’t easy for anyone. From what I have read about Eat Pray Love, I might not like it either. The Signature of All Things is worth a go. Give it a go, it seems that her writing divides people. I just think her heroine is wonderful person and a great example of making life out of what you are given. I couldn’t get through “Eat Pray Love” but I’ll give this one a go after reading your review. It’s great when a book makes such an impression on you. I’m reminded that one of the books I particularly enjoyed this year was your very own “Borderline”, and I would like to read it again. A very Happy Christmas and New Year to you and your family, Hilary. As one who rarely reads novels, I must second that remark about “Borderline”…one of the very few I read this past year, and thoroughly enjoyed! Our daffodils should be doing the same. The hedgehog came last night, in fact I think I can hear him again now. Topsy-turvy climate here! It sounds great. I’m adding it to my never ending list. Mine is never ending too. I’ve just been given another three for Christmas that I want to read now, but I am in the middle of three already. Keeps me happy! Loved this post. I recommended this book to Amy after she turned her noise up at Eat pray love. I knew I would convince her to love ELizabeth Gilbert with this book. I thought Eat pray love was exceptional I know it has some harsh critics and the writing isn’t as sophisticated as Signature but I found it profoundly changed my life. Her booked helped me through a difficult break inspiring me to take an 8 month trip round India. Her words helped me so much.. I think Signature of all things is a totally different style, an epic and so interesting to read about women in science she researched this book for 3 years! Do you know she based Alma on many women in history but one being Marianne North. I love her botanical paintings and she was so pioneering going all over the world to paint. You can find her paintings in a building in kew gardens. Anyway I better stop but I could talk about her and this book and her for ages! Hi Anja, thanks so much for dropping in and even more for persuading Amy to read Signature, which in turn brought the book to me. I can see from reviews that how you reacted to Eat Pray Love would depend almost entirely on what was happening in the reader’s life. I am thrilled to hear about Marianne North and will look her up. I haven’t yet read any Ann Patchett, but I’ve just had a browse on https://www.brainpickings.org/2015/04/27/ann-patchett-on-writing/ and I’ll try and get to her sooner rather than later. I’m going to look for it – thanks for the recommendation. I think this book would appeal to you. I was telling my brother about it a week ago and he said he usually enjoyed my recommendations and mentioned your book! Garrya have been popular in the UK as long as I can remember. They are often grown against a wall here as they are vulnerable to deep frosts. People mostly buy the males here, as although the females have the fruits in summer, the males have the longer showier catkins. I can’t remember what this particular variety is called. Oh I must try this one, thanks, I love Kew and did a course there on botanical illustration. Not good at it but I think it has helped my writing! My daughter gave me the Tea Planter’s Wife to read. Straightforward narrative but I thought a powerful read and got hooked. Then my husband reads it and says we met the author, before she became a best seller. She lived in the next village to us and came to tea! Perhaps it will rub off on me! If you love anything growing, you will love this. There is a lot else going on besides the growing, but this is still the underlying stream that runs through the story. I am going to try it online very soon. Will report back but you say it’s long so may take a while!